The State Museum and Exhibition Centre Rosphoto presents an exhibition of Soviet film stills within the framework of the Year of Russian Cinema. The exhibited works include photographs taken for different movies from the period starting with the 1930s to 1971. The authors of the film stills remain unknown since it was common practice to ignore the signatures on photographs sent to cinema theatres and the press. The displayed works are divided into two parts. The first one consists of film stills for the classical movies of the 1930s and come from the album published by The Leningrad Society of Educational and Scientific Cinematography (1936–1939). Several such educational albums dedicated to the history of Russian and foreign cinema were issued in 1937. The exhibition features the contents of the third volume illustrating the sound film era in the Soviet Union. The 1930s in the USSSR were marked with the rapid industrial growth, and non-fiction cinematography became predominated by educational and technical, propagandistic and classroom films. Leningrad was one of the main centres of the science and industry as well as of the cinema. Here The Leningrad Society of Educational and Scientific Cinematography was founded in 1936. It was a free union of cinema workers meant for education of the Soviet people. The Society focused mainly on the creation of educational exhibitions and printing photo albums. Such albums were sent to different cities upon requests of educational institutions. 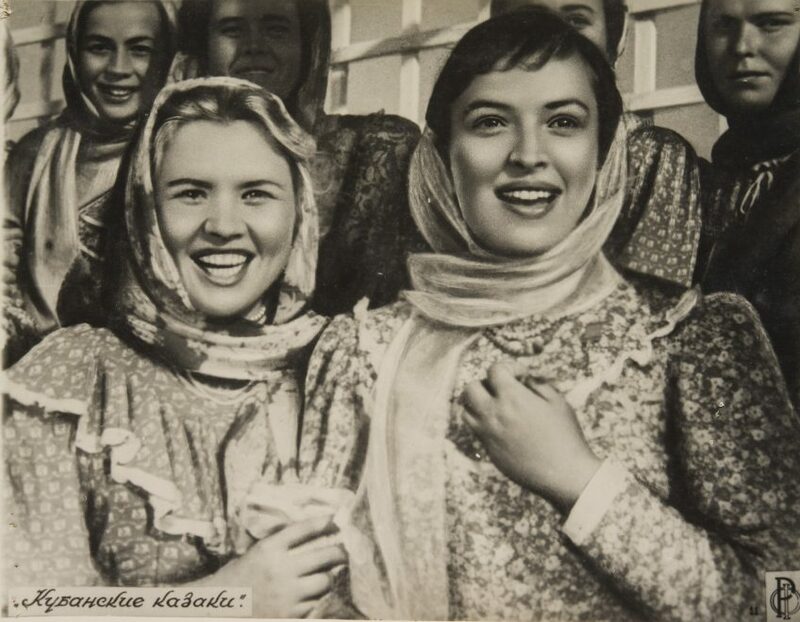 The second part of the exhibition consists of photographs for film advertisements of various Soviet studios (Mosfilm and Lenfilm, as well as Kiev, Tallinn, Minsk, Riga, Tbilisi, Yerevan, and Kishinev film studios), created during 1940–1971. These works include photos representing famous films (Cossacks of the Kuban by I. Pyryev, Lady with the Dog by I. Kheifits, Brief Encounters by K. Muratova), as well as the long-forgotten ones (Dark is the Night by B. Barnet, Thrice Resurrected by L. Gaidai, Blue Arrow by L. Estrin). Placed in chronological order, these photographs demonstrate the metamorphosis of Soviet film heroes and the motion picture visual. Cinematography evolved from studio stage to location filming, from ideological illustrations to humanity, from poster-like imagery to delicacy, from overemotionality to restraint, from sculpturesque heroes and repeating arrangements to liveliness and variety. Film advertisements of the first years of the Soviet country present a reminiscence of the silent film era when the actor’s meaningful glance and posture worked as a substitute for speech. Besides, the actors featured in films were prominent thespians (Moscow Art Theatre school, Maly Theatre), who could show expressive emotions with their eyes, without excessive facial gestures. Therefore, the posters showed mainly half-length portraits of two or three characters talking. They were depicted en face or half-turned, their mouth sometimes opened in a smile or some slight grimace, but never for pronouncing their lines. It was due to the fact that the image should be sharp and light. Unsharp images were considered a waste. The lightness was also essential, and photographers never failed to follow this requirement: even if the events of the film took place at night, the faces were spotlighted for the photographs, though in the movie they could be in the darkness. The explanation is simple: film duplicating from original photos resulted in numerous copies of a very high contrast. The technology was far from perfect, and the film stills appearing in the cinema theatres and magazines had such deep black shades and blank white spaces, that all details were lost. The originals had to be ‘sharp and light’ so that the actors’ faces would remain recognizable and the emotions clear. The photographers were allowed to take pictures after successful takes, while the camera operator’s assistants were already moving the camera to another spot or changing the lenses, but the lighting was still on. The photographer made several pictures of actors who posed for him. This is why it is incorrect to call such photographs ‘film frames’. The film stills of that time were quite monotonous because the genre system of the Soviet cinema was not an elaborate one: there were film adaptations of classic literature, comedies, musical films and fairytales. The rest fell under the category of ‘movie-essays’ or film-novels (sometimes film epics), which in turn could be divided into historical-revolutionary, war and classroom movies. The plots of film stills could not be diverse since there was no variety in the setting: inside the tank or a tractor, in a trench or workshop, at the classroom, etc. The photographers were assigned to join the film crew during the preliminary stage of the filming process. They followed the camera operator, artists and directors to choose the setting, sometimes took pictures for photo testing, visited museums and archives for relevant materials. They developed the films, printed tiny positive images, and after that produced sample packages of film stills for advertising. About ten unit still photographers that were bound to follow the crew worked at Lenfilm studio. Besides, there were around two or three photographers working at production facilities. They also took part in photo testing, took pictures of the crew, photographed historical materials, and prepared various photos for the set. All photographers were assisted by technicians: two or three women working with the black and white print and one working with colour print. The assistant who worked with colour was fully responsible for colour rendering, which required huge efforts and a very high level of skill, since the Soviet developing paper was extremely hard to handle. There also was a colour correction artist, a woman in front of a drawing easel, who covered the scratches and flecks of dust on the prints or film with a thin paintbrush or a pencil. She also made stylized versions of photographs for the set, helped to make companion portraits from separate photos, etc. Nowadays a truly unique and original film poster is even more of a rarity than an original film. A poster is made for the viewer to immediately ‘recognize’ the genre, to match the possible plot with his favourites and to buy a ticket. That is the reason the posters are alike. The creators of ‘ancient’ Soviet film stills pursued other objectives. We would like to express our gratitude to Russian cinema researchers Miroslava Segida and Sergey Zemlyanukhin; film expert and historian, senior curator of scientific projects of Gosfilmfond Pyotr Bagrov; film historian, Lenfilm veteran Dmitry Ivaneev; former employee of Informburo Galina Antoshevskaya; former Lenfilm photographers Galina Lisyutich and Yury Trunilov, as well as film director Mikhail Zheleznikov for their invaluable help in preparing the exhibition.